Abraham Lincoln's most famous speech was delivered at the dedication of the Soldiers' National Cemetery in Gettysburg, Pennsylvania on November 19, 1863, during the Civil War. 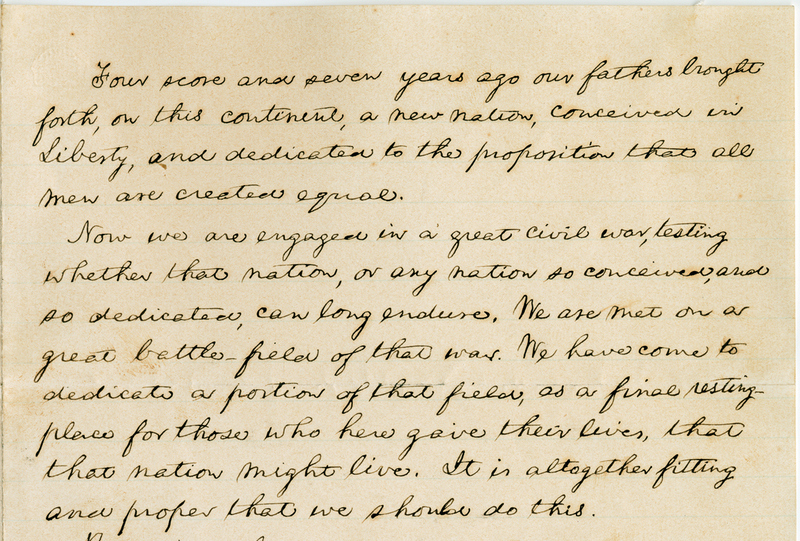 Cornell University has one of five known manuscript copies of Lincoln’s handwritten speech. To commemorate the 150th anniversary, Cornell University Library’s Division of Rare and Manuscript Collections invites you to a faculty panel discussion and a reading of the Gettysburg Address by President David J. Skorton. The faculty panel includes Edward E. Baptist, associate professor of history; Shirley Samuels, professor of English and chair of history of art; and Margaret Washington, professor of history. Following the reading, the Cornell Glee Club performs Lincoln the Musician, a newly commissioned piece by Toby Twining and directed by Robert Isaacs. During the sesquicentennial anniversary, Cornell University Library will host a series of events, including a film showing of the documentary The Gettysburg Story on November 12, a lecture with Gabor S. Boritt, author of The Gettysburg Gospel: The Lincoln Speech That Nobody Knows, on November 13, and an exhibit in the Carl A. Kroch Library. To view a live-stream of this event visit: http://www.cornell.edu/video/gettysburg-address-150th-anniversary. A reception will follow the presentation in the Carl A. Kroch Library, level 2B, at 6:00 p.m. The exhibition and associated events are funded by the generous support of the Nicholas H. Noyes Jr. Memorial Foundation and Gail’56 and Stephen Rudin. It was very moving to hear President Skorton read Cornell's version of the Gettysburg Address, including "under God." Great event!